It’s been a while since my last blog entry for OpenPaddock.net, and a lot has happened since then! Long Beach ended before it started, an amazing four wide finish win in the Freedom 100, and a trip back to Ireland to get my visa extension and to see some family. I am going to fill you in on how I made it through all this crazy stuff over the past few weeks. 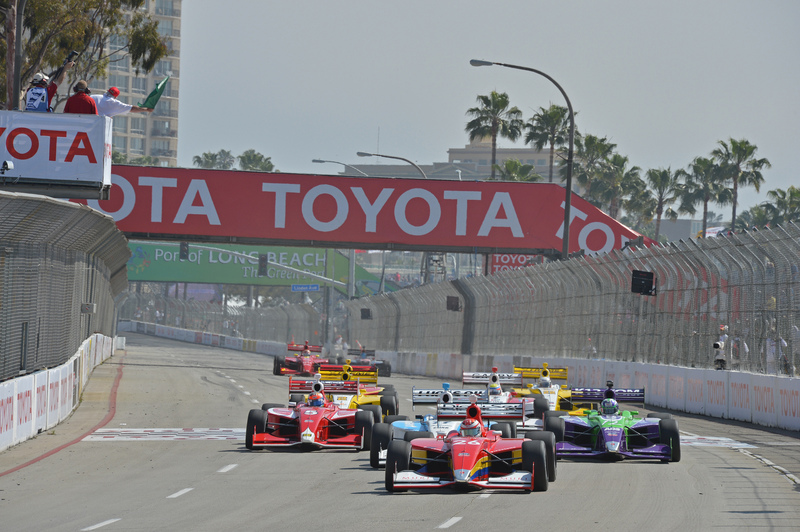 Let’s start off with the race weekend on April 24th at one of my favorite streets courses, the Toyota Grand Prix of Long Beach. 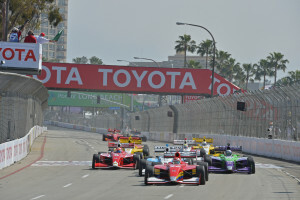 It was a bit of a disaster for all of the teams to even get out to Long Beach as both Indy and Chicago got hit by bad rain storms. I ended up hanging around the Chicago (ORD) airport all day! I eventually arrived at the Long beach hotel by 11:30 pm Thursday night. With a practice session Friday at 12:15 pm, it was time to get some sleep, as we also had a two hour time difference. I was heading into this race weekend in a different mindset from both St. Pete and Barber. 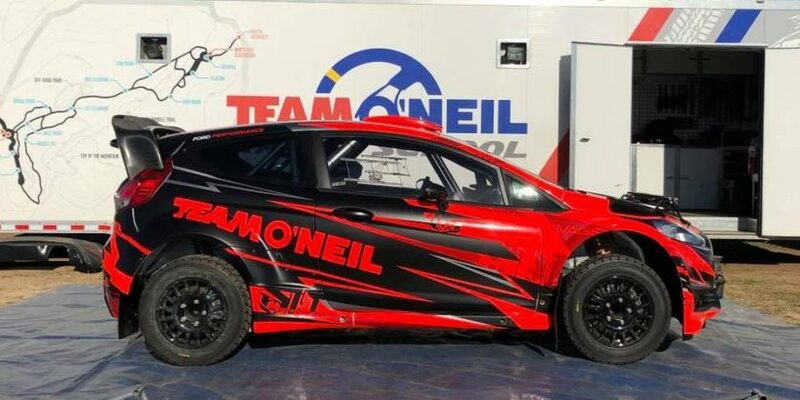 I was fed up of driving conservatively and thinking about the championship. My aim for the weekend was to drive every single lap at 100% and see what we got. 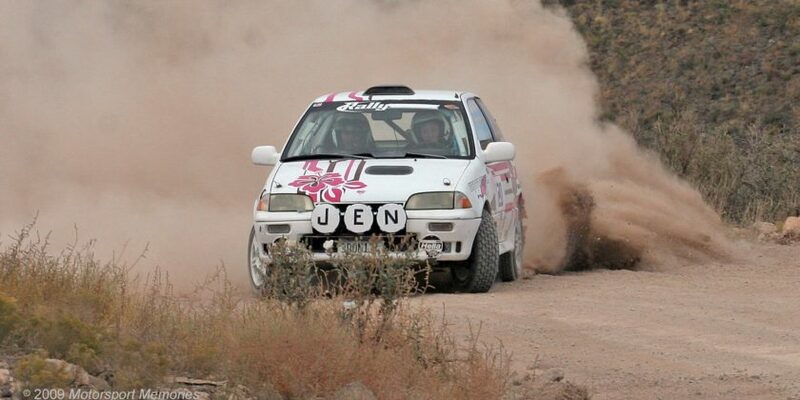 This is how I have always raced and really the way I enjoy driving. I had been training harder than ever and really felt that I was ready to turn things around from Barber and get a good result for my team, Belardi Auto Racing, and myself. 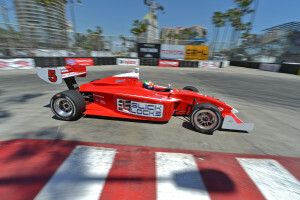 Long Beach is also a track I really enjoy driving. I raced there in 2011, qualified 2nd, and led the race until I made a mistake and stuffed it into the tires in T9! I was ready to make up for that disappointment!! I hadn’t been in the car since Barber, hadn’t been to LB since 2011. I was so excited to just get back on track. As we rolled out for the first session, I didn’t waste any time on getting up to speed and feeling the car out. We were quickly up to P1 and feeling good. After just a few laps, there was a red flag for Car #77 as he hit the wall big time coming off of Turn 8. That gave us the chance to make some changes. It went green after about 15 minutes, and we continued with our program. By the end of the first practice, the car felt decent, and we ended up with a solid P2 +0.1 away from Carlos Munoz. After a few hours of debriefing and coming up with a plan for practice two and qualifying the next day, I headed off to get some dinner and an early night! Saturday morning I was up and feeling fresher than Friday! I got some breakfast, and I arrived to the track at 7:00 am as our practice was at 8:30 am. We had made some overnight changes to the car, and I was looking forward to getting on track and feeling things out. We get three sets of new Firestone tires every weekend, and typically we have tried to save them for qualifying and the race, but this weekend we decided to put on new tires in Practice 2. The reason for this was to give me more confidence and a better understand of what to expect before qualifying, especially since this weekend Practice 2 and qualifying were on the same day. As Practice 2 went green, we went straight out were up to speed quickly again, sitting in P1 early in the session. With some more setup changes during the session, the car was feeling better every lap. With about 15 minutes to go, we made a pit stop for new tires and headed back out. I really didn’t get the most out of the tires, but we still ended up P2 behind Munoz and missing that +0.1. There wasn’t a huge amount of time before qualifying, so it was time to get to work both for me and the crew. We knew we had to try to squeeze more time out of the #5 Belardi machine. Qualifying hadn’t been our strongest point this season, and I was ready to change that. The session started off well; we were fighting for top honors all the way through and with 15 minutes to go, we were P1. I felt with one minor change and my final set of tires we certainly had a shot at the pole. I pitted with 10 minutes to go but unfortunately there was a miscommunication, and we didn’t have the final set of tires ready. This left us is a position not to improve on our best time. We went out to try anyway but then we got badly blocked on our final three laps, and that was it. We ended up P4 unfortunately, and we would have to race them from there! The race was the next day, so I got a good night’s sleep and was ready to go! The good thing about the race was that we were the only car on the grid to be able to start on new Firestone tires. I was excited for the race, and I really knew I was going to need a good first lap if I had any chance to win the race. On the warm-up laps, I was making sure I had good tire temperature, and coming to the start, I was ready to go. I got a decent start and was in the draft of the #77. I could see him starting to squeeze the #12 towards the wall on the front straight. I decided to get out to the right side in case they made contact. They did just that and went hard into the wall on the left and straight across the track and into me, ending my race before it even started. This was so disappointing for my team. We didn’t even get to Turn 1, and our car was destroyed through no fault of ours. That is the worst feeling in racing, when you get taking out by someone else’s stupidity. It left us in a bad position as we were due to test at Fontana the following week. The series had to cancel anyway as so many cars had major damage from the race. The next test for us was the Indy open test on May 2nd. My crew had worked tirelessly to get the car ready for the test at Indy. It may not have looked the prettiest, but we made the test, and it was a really good one at that. We left Indy feeling confident with our package heading into the Freedom 100, and that we might have a shot to win it. Editor’s Note: Thanks again to Belardi Auto Racing’s Peter Dempsey for sharing his experiences as a racer in the Firestone Indy Lights series. Be sure to check back tomorrow as we will have Peter’s thoughts and insights from the Indianapolis Motors Speedway. If you aren’t already following Belardi Auto Racing and Peter Dempsey on social media, here’s where you can find them.